Well, it seems that we have all had some stuffiness issues over the passed two weeks. Michael and Tiffany both had the yucky stomach bug as well. Thankfully, Sean and I skipped that horrendous episode. But with all this yuckiness around, it means that we have not had Liam for a while. I sure do miss his sweet face! 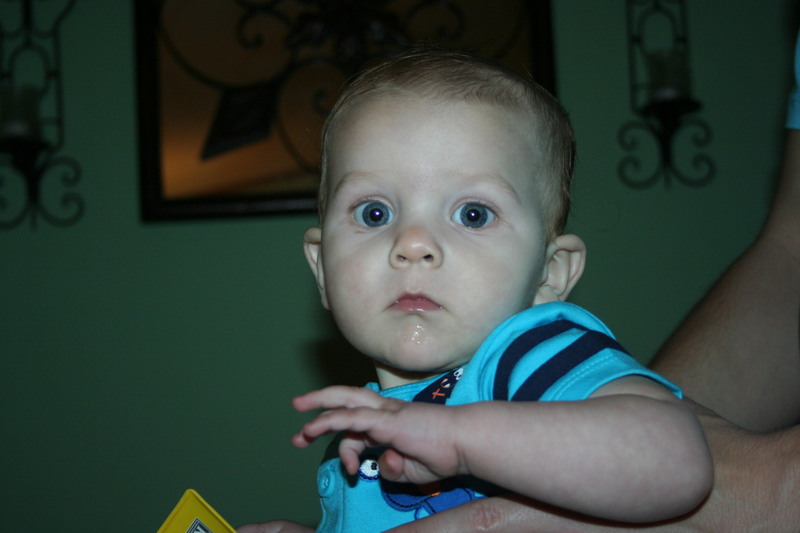 I just love this expression he gives me. It’s like, whatch you doin’ Grandma. Here he found the snack stash! I’m going to have to get better quickly so that I can see him again. 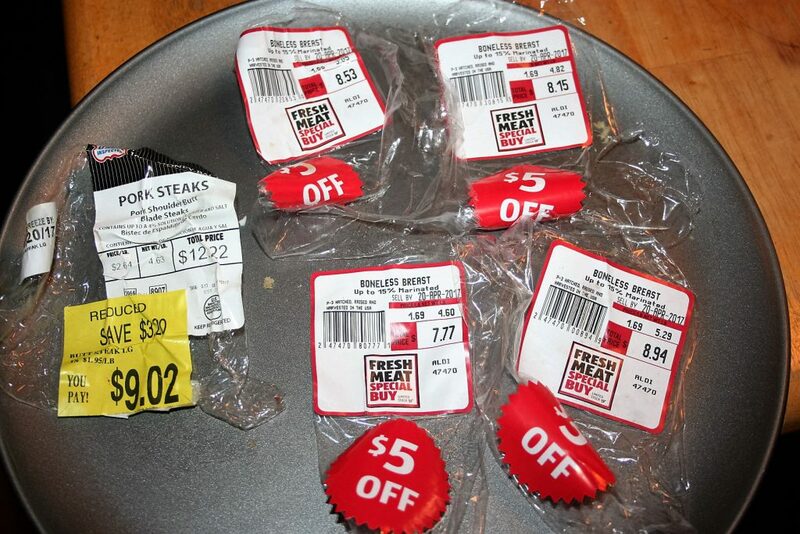 Last week when I shopped I got an incredible deal on meat!!! I got over four and a half pounds of pork steak for $9.02, which was $1.95 a pound; a pretty good deal. 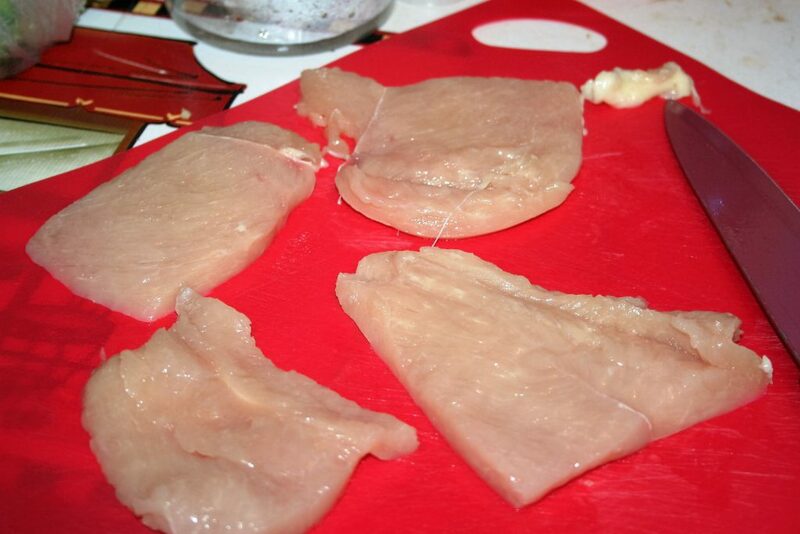 But the awesome deal came on the boneless skinless chicken breasts. They were already on sale for $1.69 a pound but I got $5 off of each package! So I paid 68¢ a pound for nearly twenty pounds of meat! I’m still stoked by this. 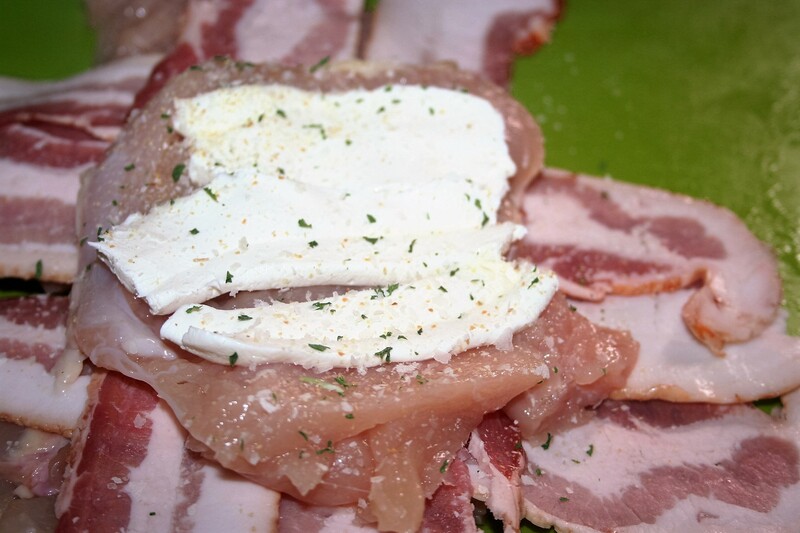 Being on a keto diet, we don’t eat as much of this lean meat as we used to, so this will last quite some time. I put each breast in a quart freezer bag (each one weighs about a pound) and then filled a gallon size freezer bag up with the individually wrapped breasts. 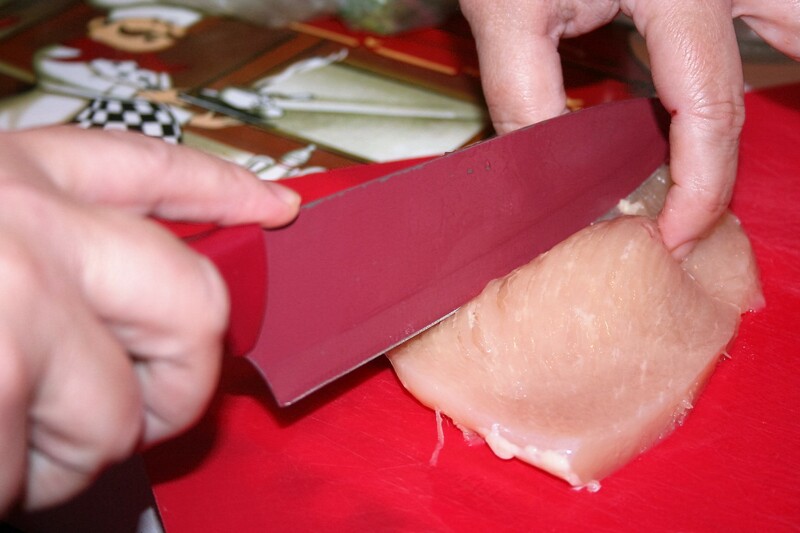 Now when I need a pound of chicken breast, I just take out one baggie and it is not stuck to any others. With four people eating each night, one pound is usually the right size portion. 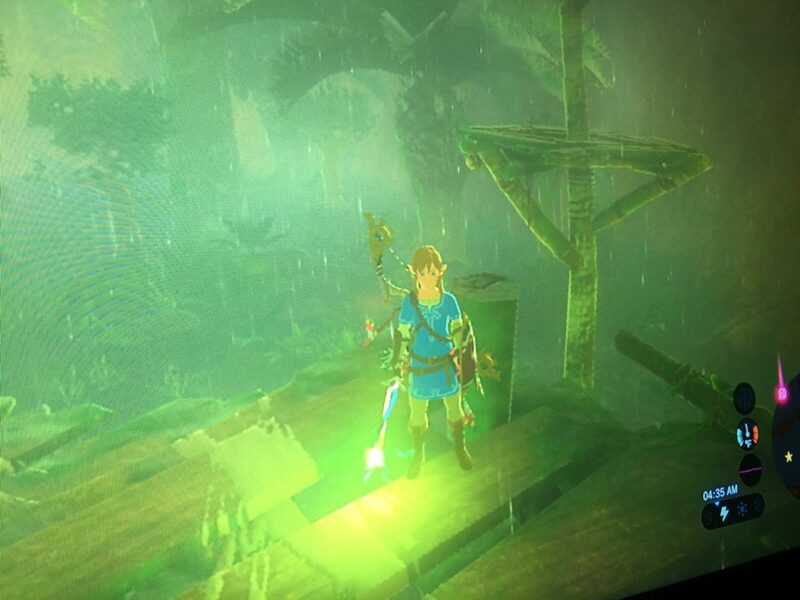 I’ve also been enjoying playing Zelda: Breath of the Wild still. Now I will give a disclaimer here. There is mention of goddess and pray. When my kids were young and they wanted to play a game that had something little in it like this, they would tell me how they fix it in their head. In a lot of games there is ‘magic’ but it really was just a combining of elements together. 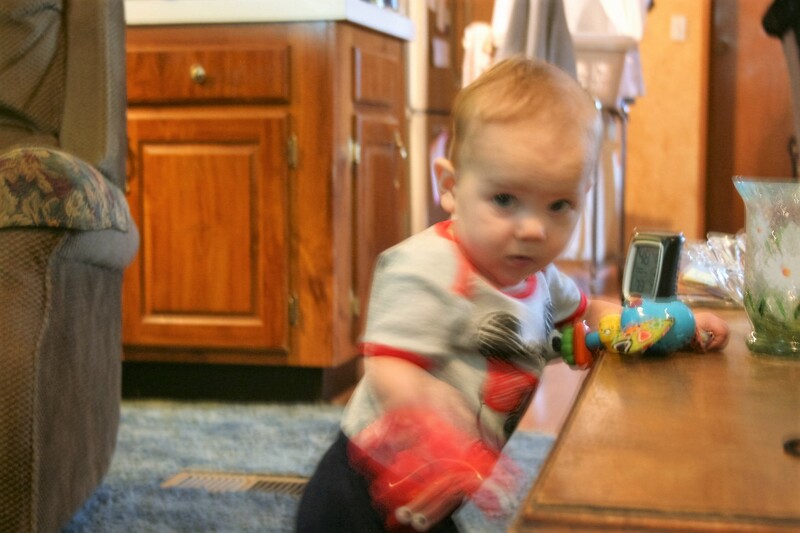 Sometimes they would tell me, Mom, it’s just technology. As long as they kept the right mindset, I’d let them play the game, that is most of the time I would. This is a huge game! Much discipline is required to not play it all the time. There are lots of little side quests, lots of areas to investigate, lots of achievements to attain, and lots of fun to be had. Well, I’ll run for now. I hope you have a wonderful weekend. Words are fun. Here are some I was reminded of this past week. Pachyderm: I thought this was just an elephant but technically it is any thick skinned, very large mammal. This includes elephant but also rhinoceros and hippopotomus. 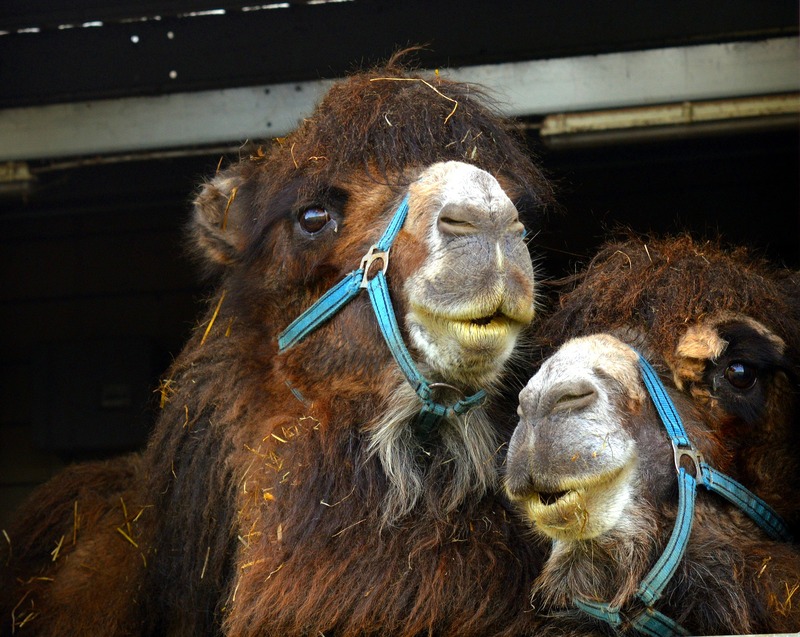 Dromedary: I thought this was just a camel but as it turns out, it is specifically a camel with one hump. A two hump camel is called a Bactrian. I always have a hard time with telling the difference between alligators and crocodiles. But evidently the difference is in the snout. Crocodiles have the pointier snout and crocodiles have the more curved. It sure would have been easier to remember if the curved snouted one was the crocodile since the first letter is a curved letter. So I guess that means I have to remember that it isn’t the way I think it should be, analytically. If you can see it, the crocodiles have their fourth bottom row teeth show over the top jaw, so it looks like a toothy grin. Or so they tell me. 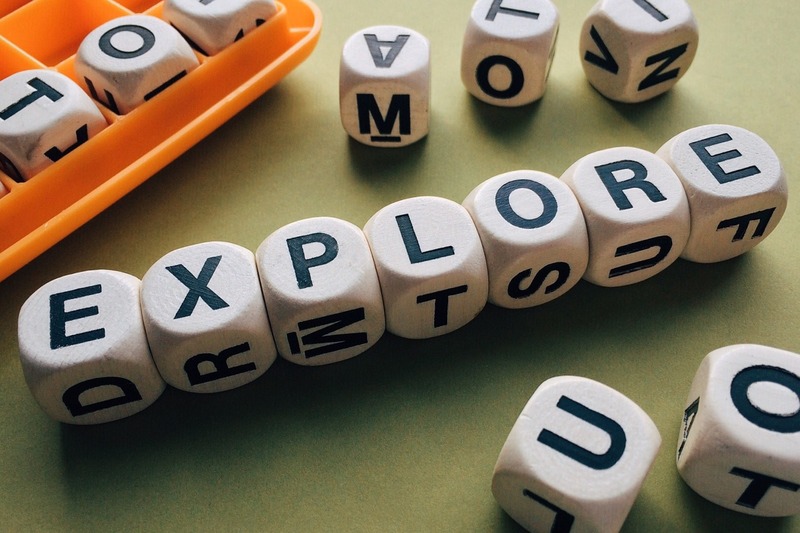 These are some words to get you started. You can stop here or use it as a spring board to talk about other easily confused critters or other big/fun words. I hope this sparks some interest and fun for you and your children. This week’s Diva Challenge is Earth Day. I decided to use a simple spherical shape for my string. I wanted to incorporate Square One’s focus tangle for the week as well; it is Funbee by Beate Winkler. It seemed like a really nice and easy tangle to use (and it was ). The daily tangle on Pattern-Collections is Pointu by Genevieve Crabe. 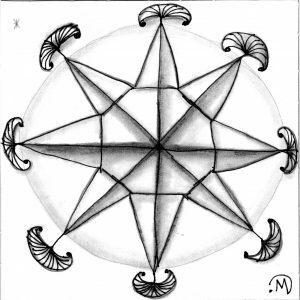 This one reminded me of a compass so I thought it would be appropriate for my tile too. 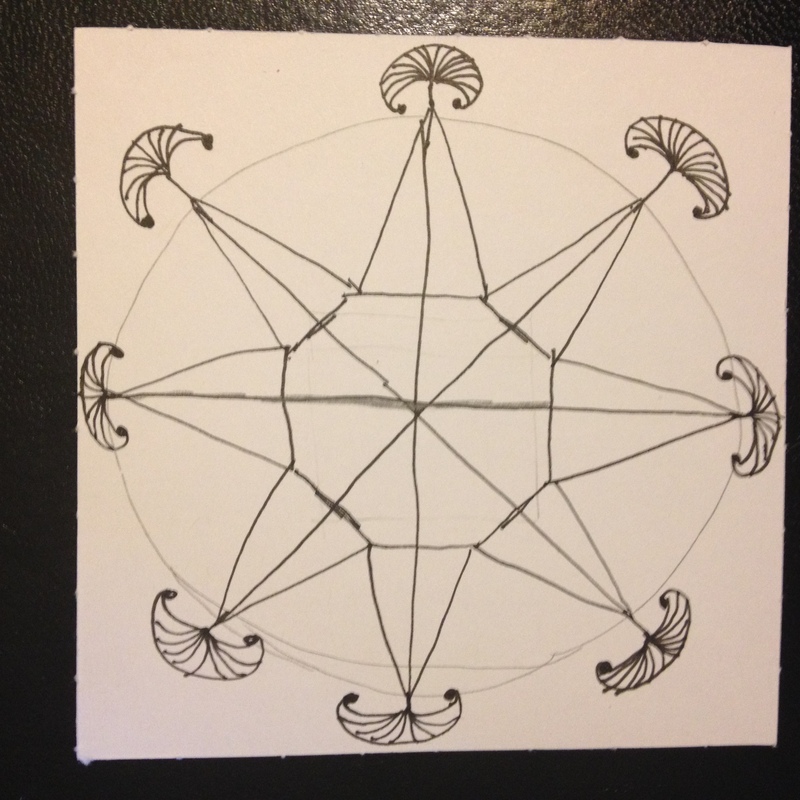 I drew my circle and my square freehand, which is not optimal for the best results. My lines didn’t exactly intersect where they should have but that’s okay. I decided to add Funbee on each point. I couldn’t use my scanner when I needed to before shading so I had to settle for a picture instead. I nearly forgot to take the picture before I started shading. Okay, I started shading the center line and then I remembered. I don’t feel I did either of these tangles justice but I enjoyed doing it and that is the point. I decided I liked the circle pencil mark there, so I gave it a little rubbing with my stump. 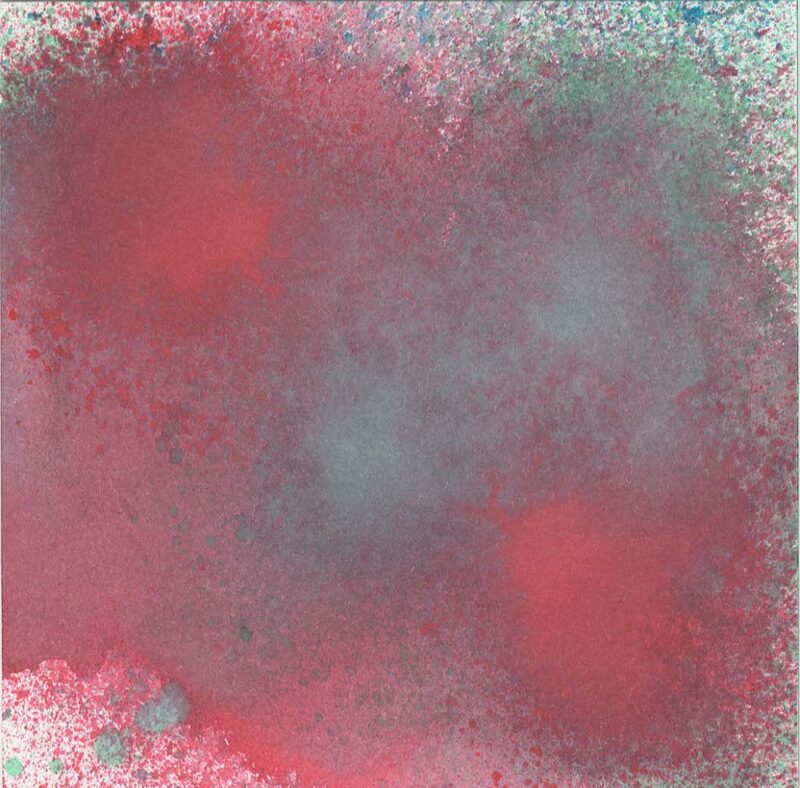 Hmm, it doesn’t really show up very well in the scan. Oh well. As you can see, I shaded on the upper side of the middle line in the center in an effort to get it where it was supposed to be. As usual, I think it looks a bit better in person. My daughter thought it looked like a shield; we’ve been playing Zelda: Breath of the Wild, so she’s seen a few shields of late. My husband thought it looked like a ferris wheel. 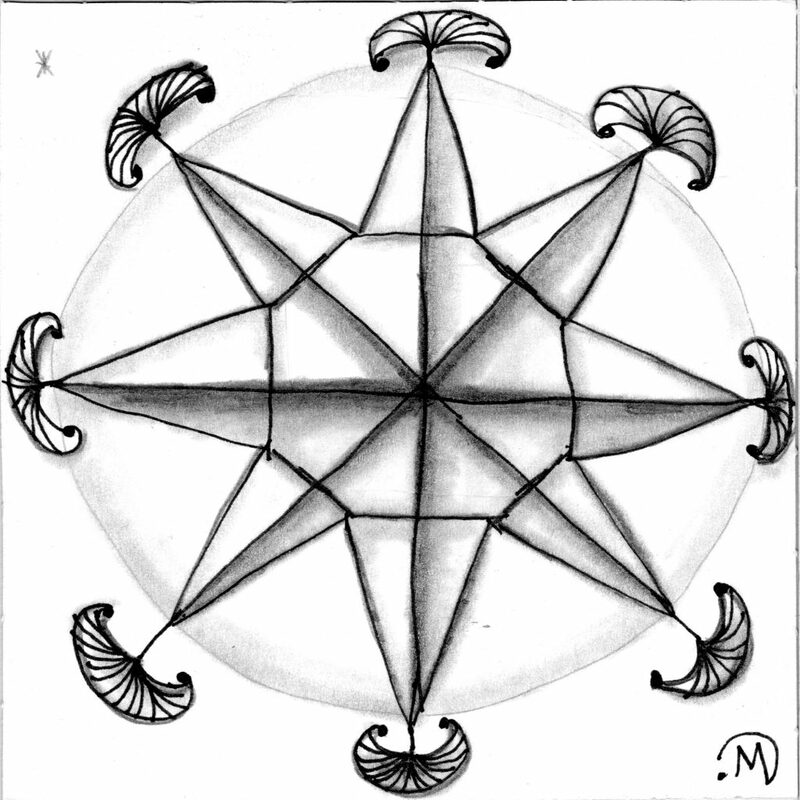 My son, who happens to have the same personality type as I do, thought it looked like a compass rose. Yep, we do that a lot. I think it looks better a little smaller . . . see? You see fewer of the imperfections at this size. Well, I want to thank you for stopping by and give an extra thanks to those who take the time to leave some comment love! You all are awesome and are such an encouragement. I really, really appreciate each and every one!!! 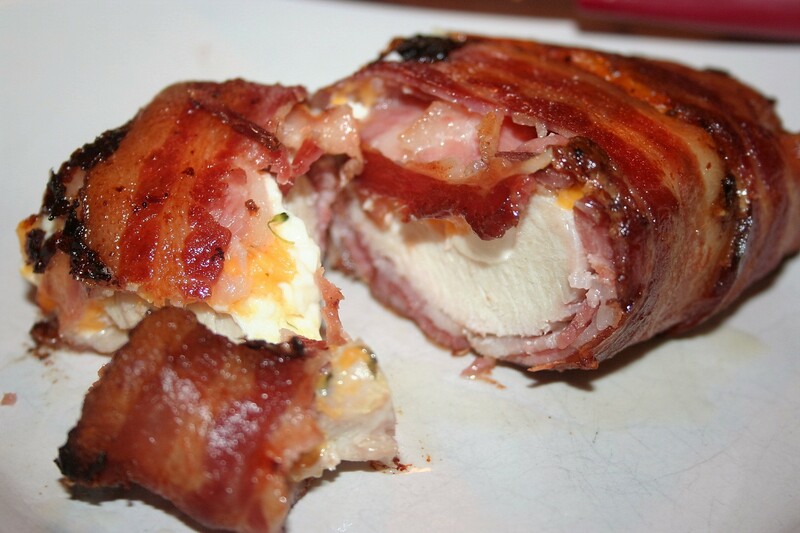 Chicken with cheese, wrapped up in bacon! Yummo! 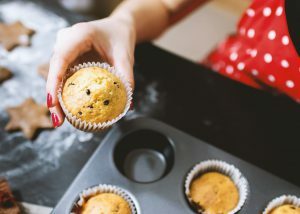 This deliciousness is excellent for those on a keto or low-carb diet but it is not great for those on a calorie-restricted diet. I found it when I was on phase three of the hCg diet. However, when I decided I needed to watch my calories, this meal became taboo. But since being on the ketogenic diet, I have revived this awesome recipe. I see on my print recipe copy that I got it from this website. 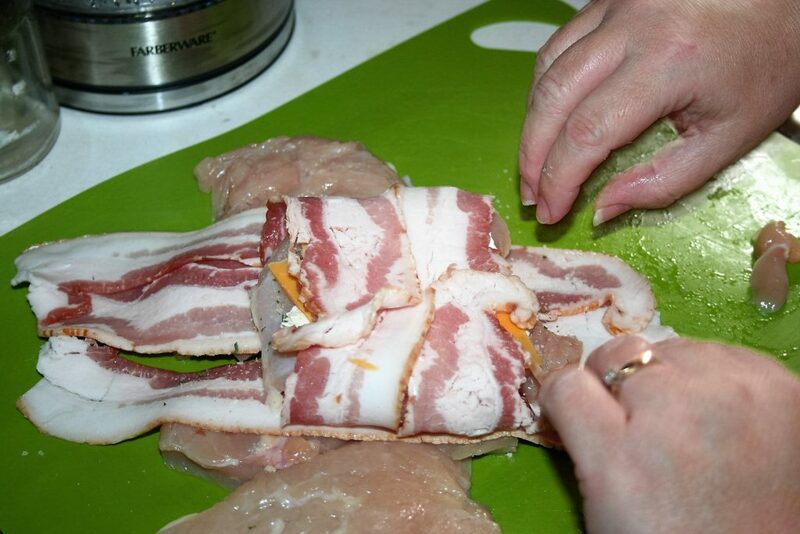 She has lots of ideas for other ‘fillings’ in this chicken that I may yet have to try. Here’s what I did. I started with a generous one pound chicken breast and sliced it about half both horizontally and vertically to get individual portions. 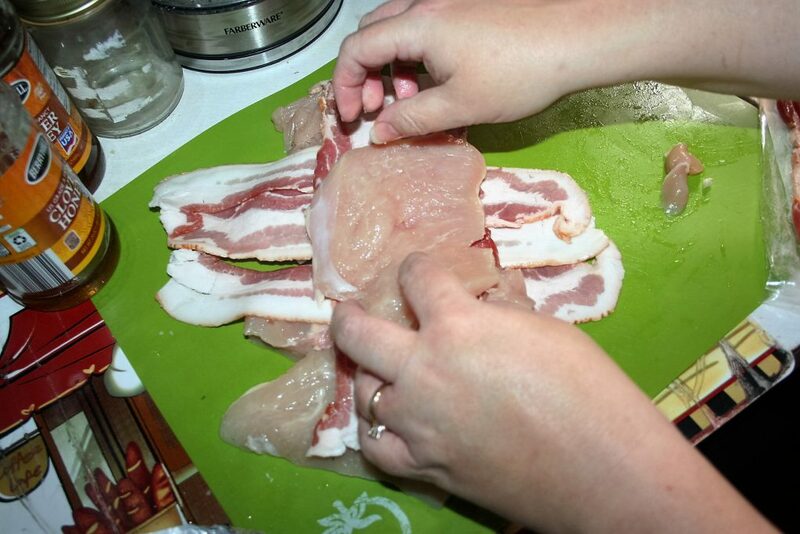 Next lay down about three slices of bacon, side-by-side in one direction and then two in the other direction. 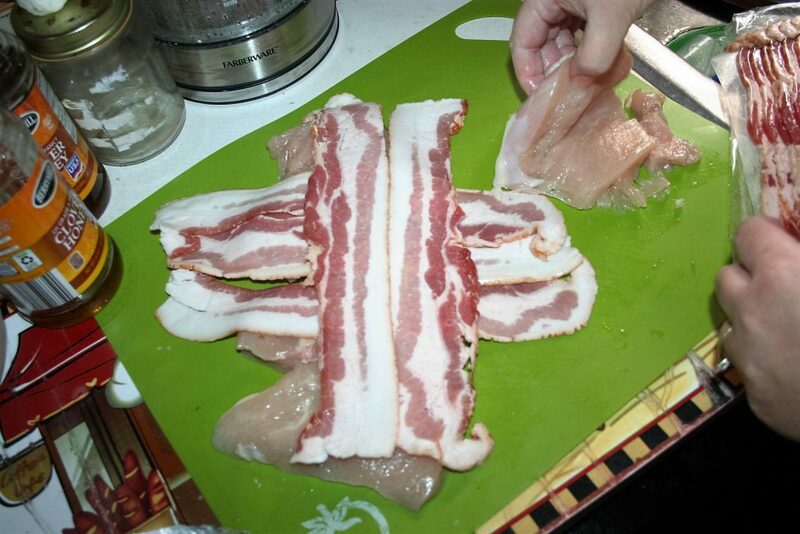 Place your chicken on top of the intersection of the bacon. 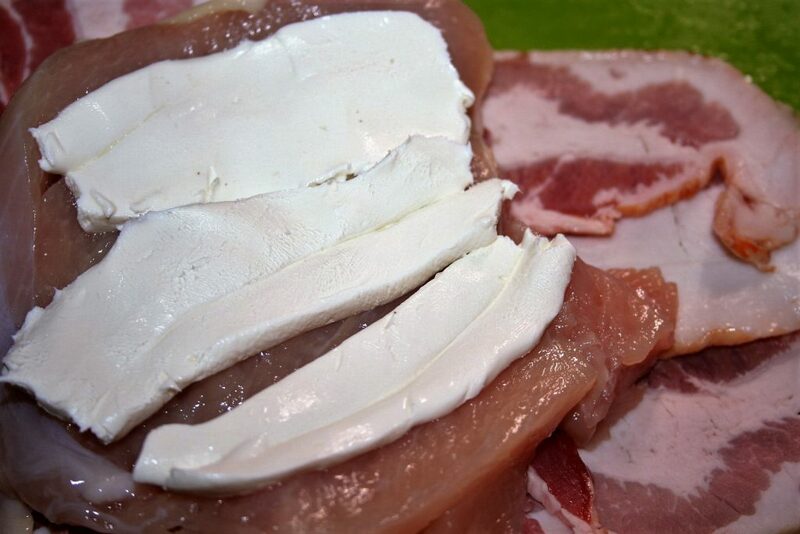 Add some slices of cream cheese. Then sprinkle with garlic salt and any other seasonings of your choice. Now add some cheese of your choice. I used mild cheddar. 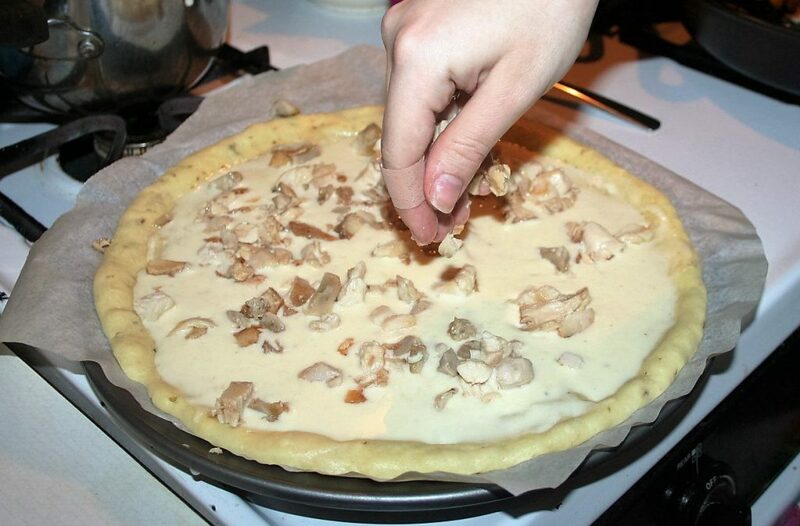 Now fold in the two slices, overlapping if possible. Then wrap/roll the three slices around the chicken. Place seam-side down on your baking pan. Bake at 400º for 45 minutes. Check it around 30 minutes and turn over to brown/crisp the bottom side. This really is delicious! Give it a try. 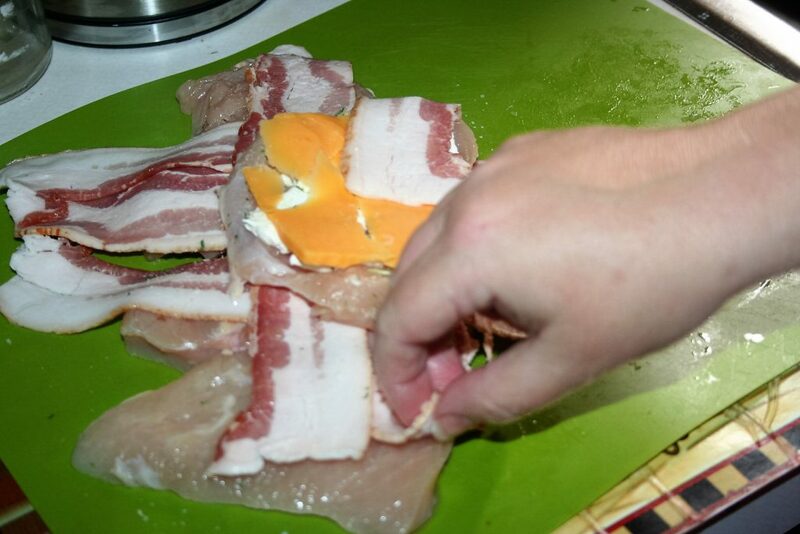 Cut cut your breast into 4 pieces and pound a little, between parchment paper or such to thin it evenly. 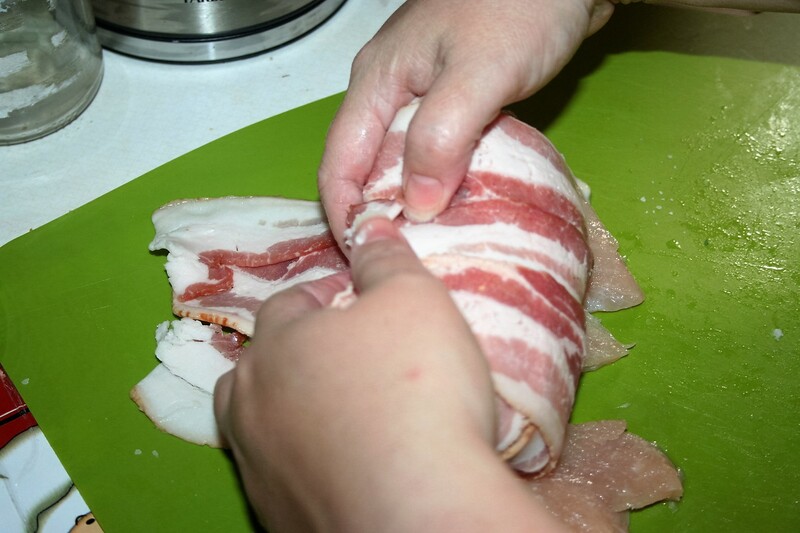 Lay down three thin strips of bacon side by side and then two slices in the other direction. Lay the chicken on top. Add a little cream cheese, garlic salt, and cheddar cheese. Fold over the two strips. 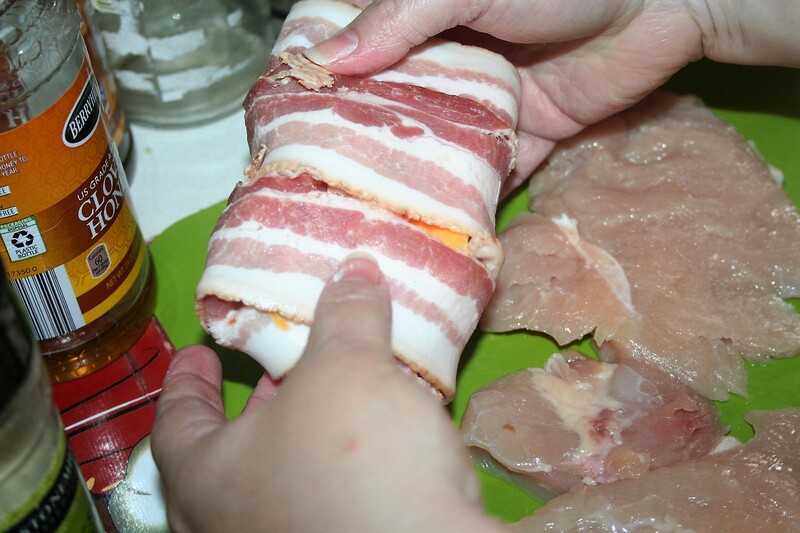 Then fold/roll the chicken on the three strips of bacon. Bake 400º for 45 minutes. Flip chicken when top is crispy to crispy the bottom bacon. I hope you enjoy this one, if you try it. I have an unmarried friend that was relating a conversation she had with another lady friend of hers. She said she was talking to her about the fact that she wouldn’t even know how to treat a husband. Her friend told her that she would treat him the same way she was treating her as a guest in her home. I thought this was excellent advice. Too many times we get caught up in the mundane tasks of life and forget this simple nicety. Not that our husbands should be sitting around waiting to be treated like company but it’s about being willing to treat him that way. Of course, he should be treating you that way as well. It really is about considering your spouse. 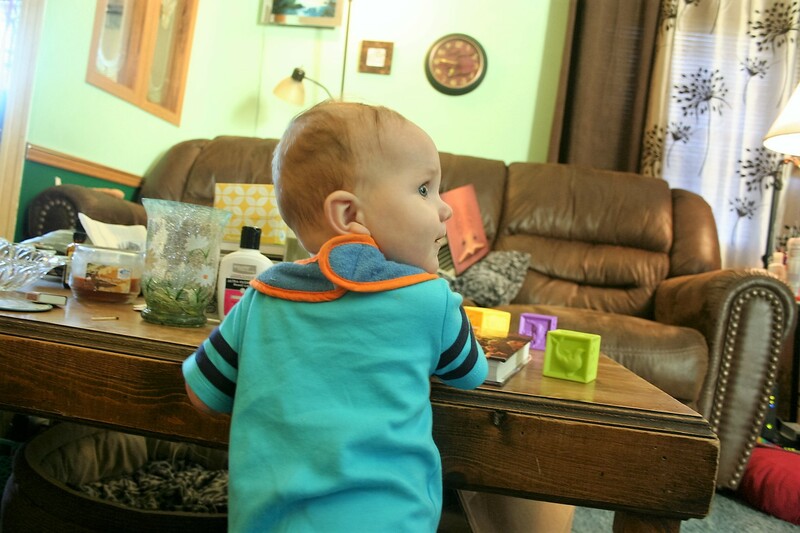 This can actually show itself in many ways, not just in offering to get things or do things for him but in ensuring the house is clean and he has everything he likes/needs. Cooking foods he likes and having snacks available that are his favorites. Actually, thinking in this manner, gives you a whole new perspective. Now I will admit, that when you are younger and have young children, this is a bit more difficult to do because the demands on you are very, very big. If nothing else, do just one little thing a day. Then after a while, that one will be almost automatic and you can add another. See how many little niceties you can get up to in a day. That is my plan. I’m going to see how many things I can do for Michael in a day, without feeling overwhelmed. Just taking it day by day, week by week, and adding one after one becomes automatic. We had a nice but uneventful Easter. I hope you had a nice one as well. I was able to wear a blouse I bought several years ago but couldn’t wear (it was so disappointing) until just this Sunday! God is so good. I had tried it on two weeks ago and still didn’t like the way it fit. I asked God to help me be able to wear it on Easter and He did! Yay!!! Sean treated us to dinner at IHOP after Sunday morning services. I like to eat there because there is so much I can eat legally. It really is easy to eat out if you are not afraid to ask them to make your food the way you want it. I got the Philly Cheese Steak without the bun and had them put cheddar cheese instead of American. I also got a side of broccoli with bacon and cheddar. Yum. Oh, I got mayonnaise too. There are lots of omelets you can get there and still eat Keto. We visited with family at my parent’s home. Brian and Lauren came with Liam. 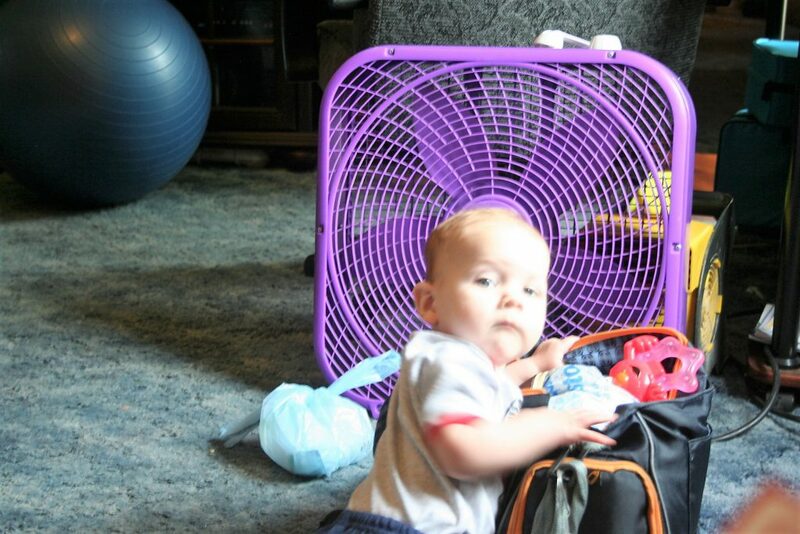 I shared him with the others there because I knew that he was coming over one day this week and would spend the night. 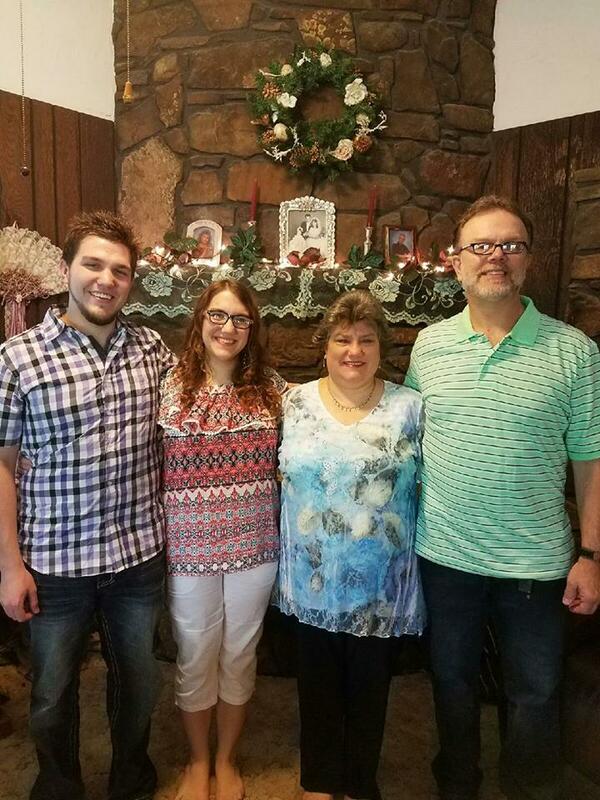 We had a good visit with my youngest sister, her family, and my parents. 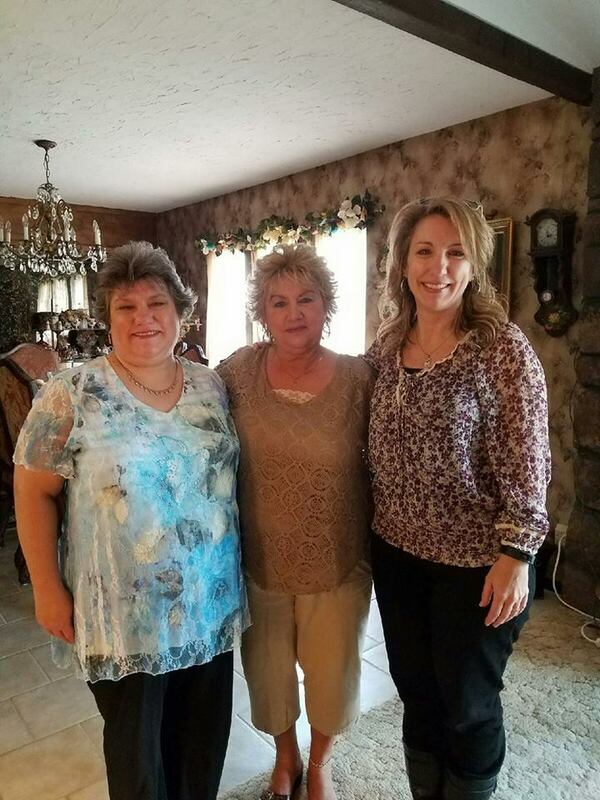 Here’s a picture of me, my momma, and my baby sister, Tracie. And here is one Mom took of Michael, Sean, Tiffany, and I.
I love that blouse!!!!! And I really like the one Michael is wearing too! Okay, I like all of our tops! We got home and we had a light dinner. I made myself busy on my computer and before long it was past time to go to bed! I’ve gotten so accustomed to coming home right after church and having the rest of the day and the evening that once I started working on my computer, I lost track of time. 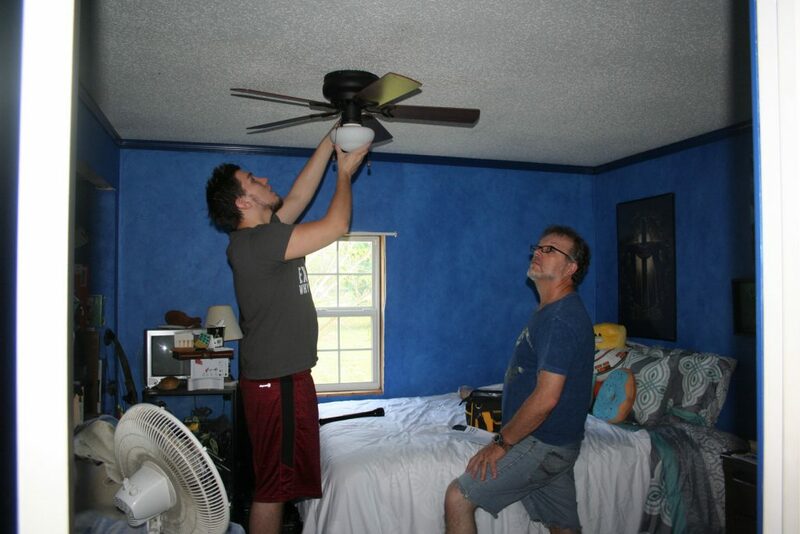 The guys got the bedroom ceiling fans up this past weekend as well. Michael keeps forgetting as he is getting into bed and turns it off. We have yet to attempt sleeping with it and not our box fan. The fans have really helped in Sean and Tiffany’s rooms. Thankfully, we got the air conditioner fixed yesterday! It’s to the point that it needs some kind of freon or something in it every year. It’s going to need replaced before too long, I think. We woke up Monday morning to a conspicuous lack of water! It has been a tough week! Something happened to the district water. Some people started to get a trickling on Wednesday but of course, not our area. 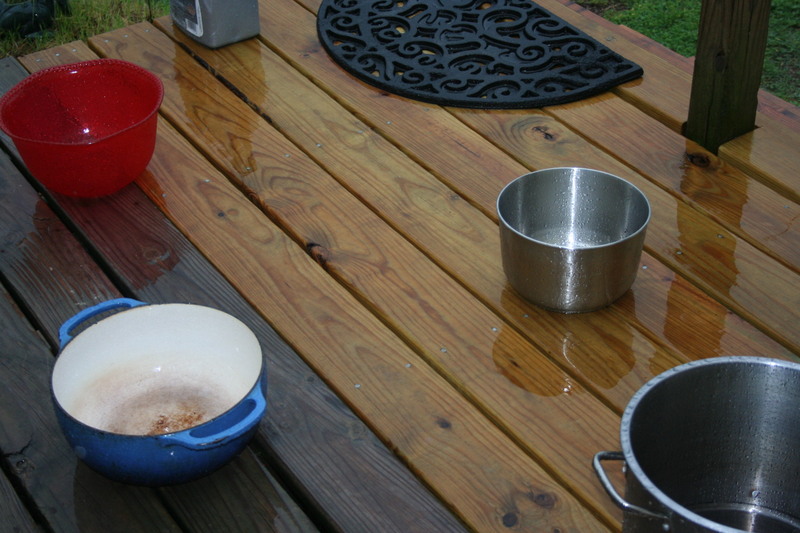 It did rain some on Monday, so I set out some big bowls and pots to collect some water. I also asked Michael to bring home some 5-galloon buckets full of tap water from in town, so we could flush toilets and have some necessary water. Did I say it’s been a tough week? Yes, it has. You don’t realize how much you turn on the spigot or how much you use and rely on water. My laundry is horrifically backed up; it’ll probably take a couple days of solid washing to get it all done once it finally comes back on. We had Mount Dishmore around here too. The first day you don’t do the dishes because you’ve filled the dishwasher and surely the water will be back on tomorrow. Then the next day you are out of space in the dishwasher and surely it will be back on later in the afternoon, so you stack the dishes. On day two, in the afternoon, I gave in and washed up some of the dishes but definitely not the ones in the dishwasher. We ended up with too much soap and our rinse water got soapy. Ugh! Novice! Finally on day four, there are no more clean dishes or flatware; there are way too many cups and glasses dirty. I finally broke and put on a pot of water to boil. After that Michael helped me wash the dishes, since he was home. I had a pot with hot water and ladle to rinse the dishes and then I dried them and put them away. Thankfully I did have some dishwashing training and sorted all my dishes. Then we started with glassware, then flatware, and worked our way through the plates. In about 30 minutes we had all the dishes cleaned and put away. It felt really good to have it done. 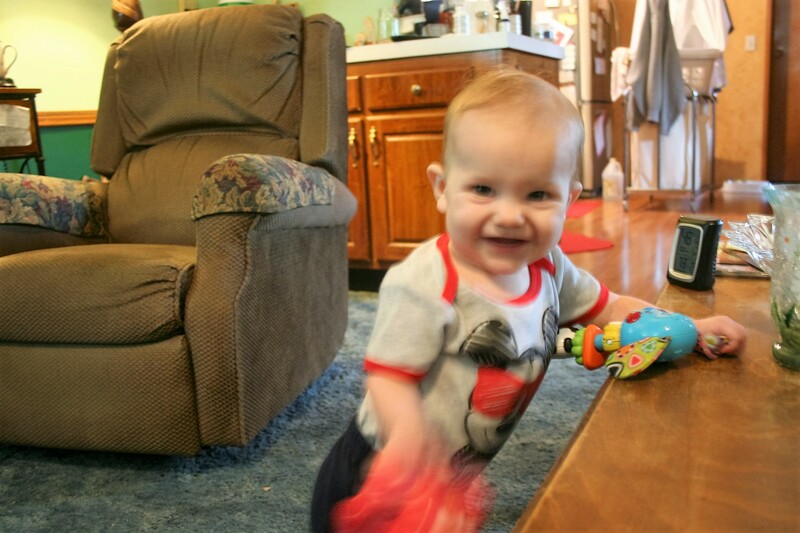 Of course the post would not be complete without sharing pictures of Liam’s visit this week. Unfortunately, the pictures didn’t all turn out that great but I’m still glad I’ve got them, even in their sorry state. I just love the look he’s giving here. This one had me cracking up the whole time he was here. 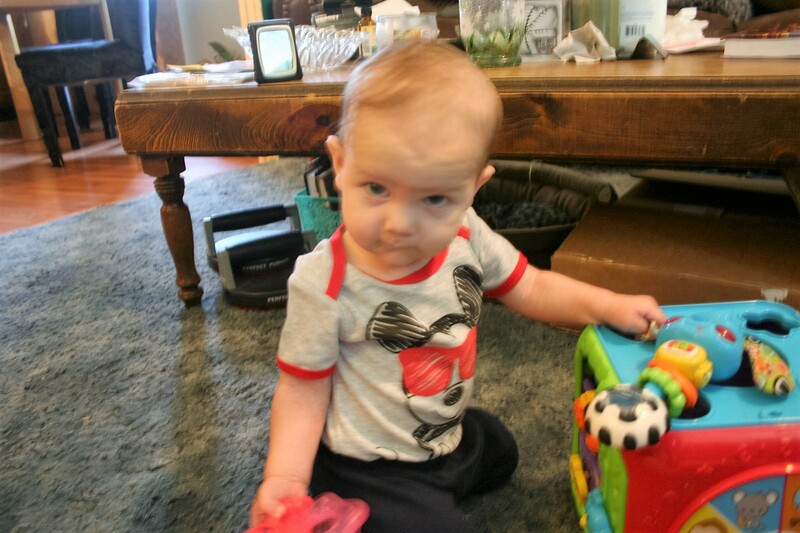 It’s like he’s saying, Whatchya’ doin’ Grandma? 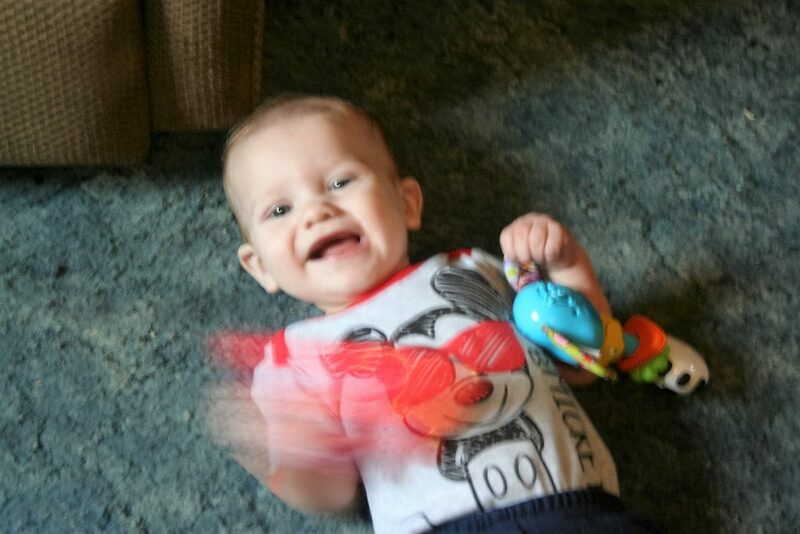 And then he got tickled. 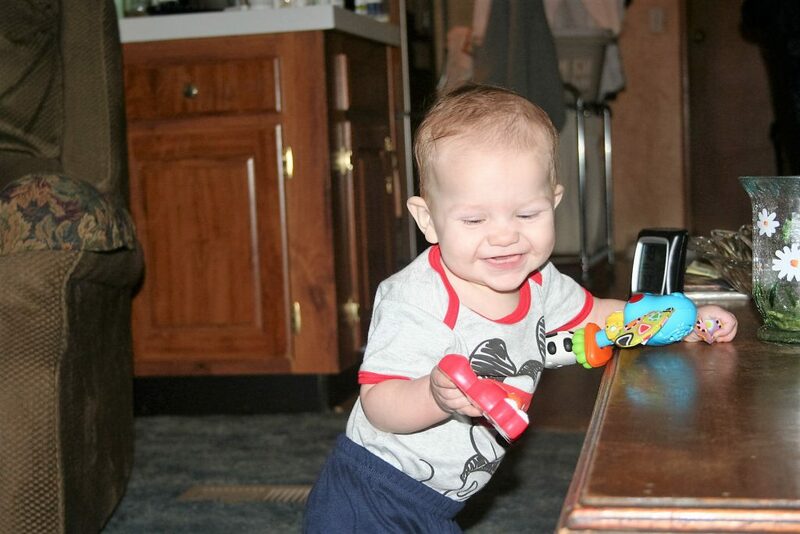 We sure do enjoy this little fella! I’m glad they let us babysit. Well, that’s enough from me for this week. I sure hope my water comes back on today! I just wanted to remind you today that games can be a good educational tool. I have a board game called NumberQuest that I played with my kids. Each child plays at whatever mathematical level they are at individually. I like math, so this one is a great one for me. Microsoft Casual Games has a couple of numbers games that can be good to help you or your child. One is Sudoku. If you are not familiar with Sudoku, it uses the numbers 1-9 and they are used once in each row, column, and grid. It is a very good game which promotes thinking through these kinds of concepts. Another math game I found recently, but have played without knowing its name, is Kakuro. This one I’ve played in paper and pencil format but recently found there is a free game app. I wish it were a Microsoft Casual Game because they have daily challenges, so there is always a new game but it is still a good game. This one is like a crossword puzzle where the digits in each square across add up to the total specified and a number can only be used once in any calculation. It’s some good thinking practice. It takes a bit to get started but I found that if I use the pencil feature and place possibles in each square, I can find the right answer in a few tries. This week I also found some good games on Gamehouse.com which may be found elsewhere and maybe even for free but I haven’t looked. One is Sumico where you are given a target number and you click adjacent tiles to sum up to the target given. It is really good and makes you think a bit. It includes negative numbers as well. Another game I played on Gamehouse is Chillout 2048 where you slide like numbers together until you reach the sum of 2048. There is some strategy necessary and lots of practice on the doubling of numbers. Well, this is running a bit long, so I’ll just remind you that there are also a lot of word games available as well. Microsoft casual games has a couple I like that are quick to play: Wordament and SnapAttack. In Wordament it is like the Boggle game where you are given grid with letters and you create words by clicking on adjacent letters. SnapAttack you are given a rack of letters and a grid with a several words on it and you try to use all of your letters intersecting one of the words on the board. There are some apps on my phone that I enjoy that provide word building: Word Bird, Word Cookies, and Word Monsters are a couple I can think of right now. I enjoy games from Gamehouse.com and have purchased some from them without incident. They allow you to play games for an hour to see if you like it enough to purchase it. They also have a monthly subscription where you can play all of their games. It is good to exercise the brain. I hope this will serve to remind you that there can be value in playing games. This week’s diva challenge is to “spill” some coffee or some such liquid, on a tile and then tangle it after it dries. 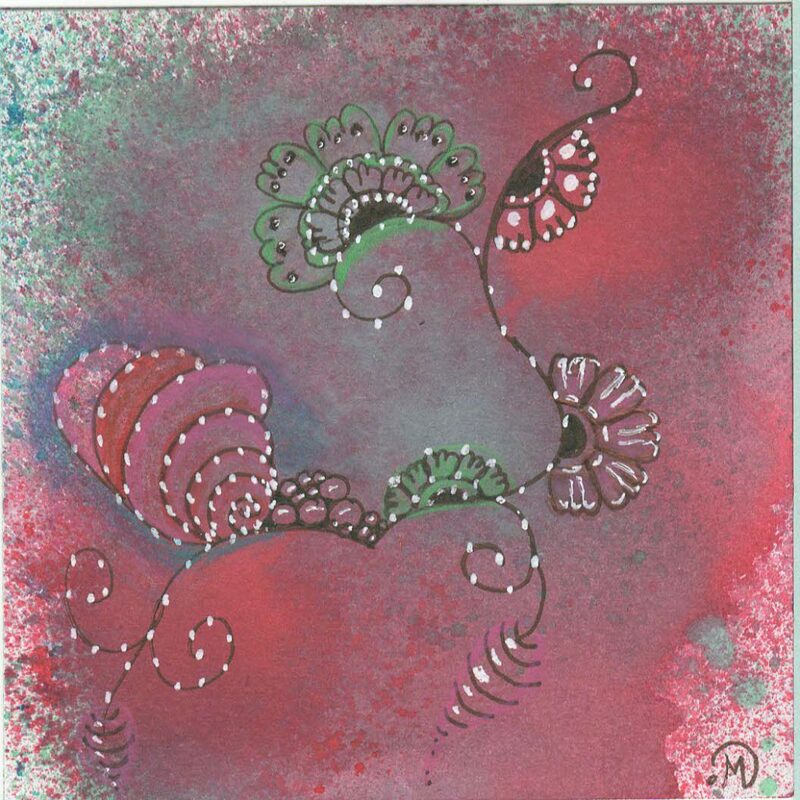 The Shading Zentangle facebook group is focusing on distressed ink tiles for the month of April. I managed to get a package of three different color stains for 40% off the regular price at Michael’s the other week. So rather than spill some coffee, I opted to spray some stain. This is my first attempt at something like this I had three colors so I did three tiles, combining two on each. 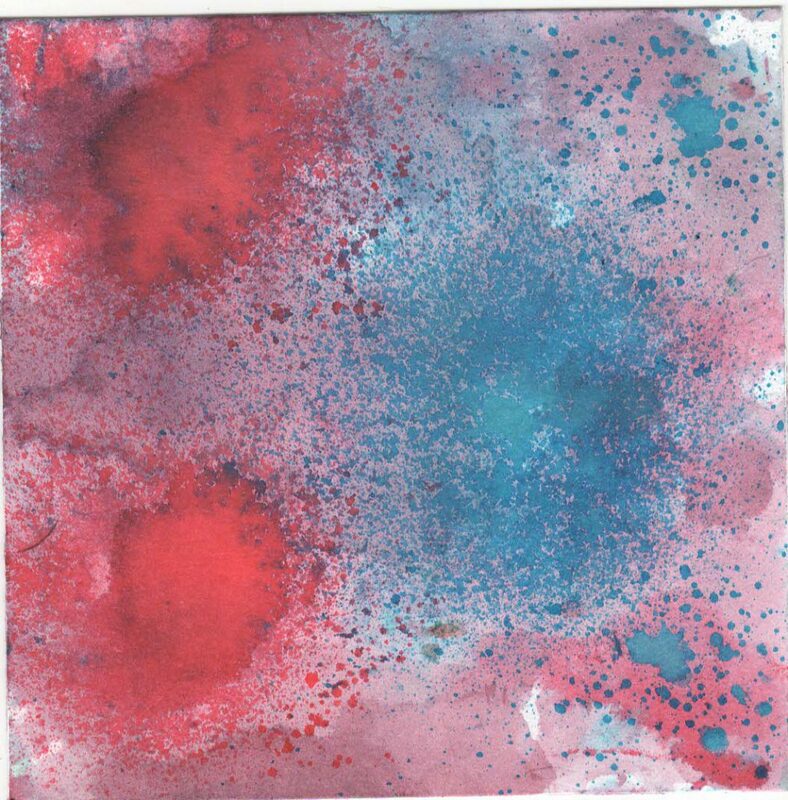 My favorite is one with blue and green but it still had a splotch of wet stain and I didn’t want to mess it up. Thus I did not scan that one. 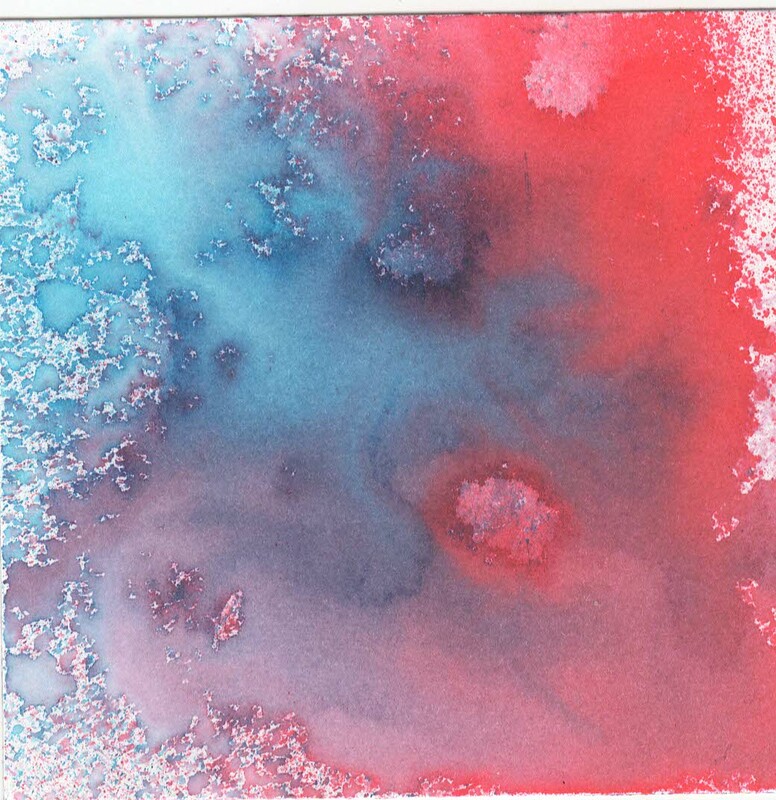 Here is are scans of the three tiles I did. I chose the first one to tangle on. It is my first ever, attempt at distressed spray ink tiles and the first time to attempt shading or highlighting with colored pencils. I did not do that great of a job of shading but I did attempt to highlight a bit. Then I went overboard on the white gel pen. Oh well! It’s a decent first attempt. I used Joki, Tipple, Zinger, and Henna Drum. I did add a bit of pink colored pencil around the large zinger but you cannot really see it in this scan. I really wish I hadn’t added so many white dots everywhere! Ugh. Once again, many thanks for taking the time to comment. I appreciate any suggestions you have for me in this new endeavor. With just three simple ingredients, this one is a breeze to make. Oh! and it is delicious! I was on a keto facebook group perusing the posts when someone mentioned this alfredo sauce. I’ve seen alfredo sauces before that use cream cheese, so I was surprised when this one did not. The person said that the recipe was from the Pioneer Woman, so I did a search for it and was pleased to find it so easily. I was also pleased to find that it was a very simple recipe. As you can tell from the featured image, I used this sauce on a pizza crust. It was very good and my family asked if we could have it again a couple days later . . . and we did. 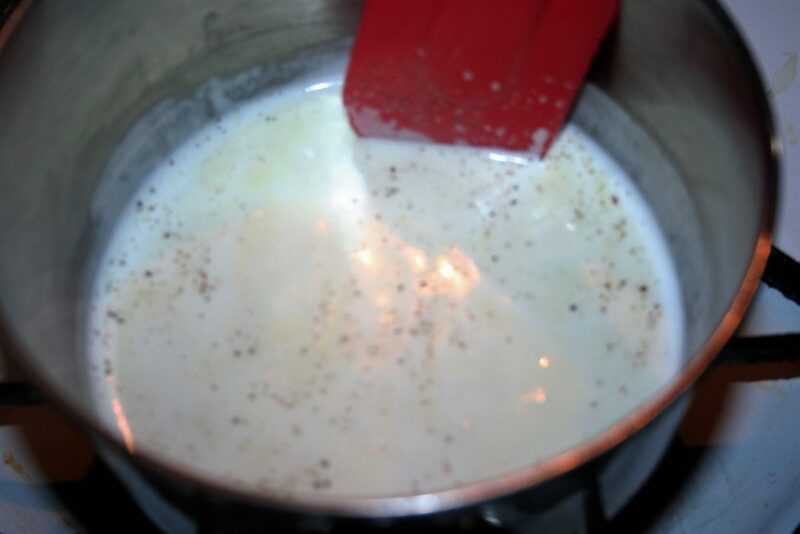 Put half a cup of heavy cream (or heavy whipping cream) in a saucepan with half a stick of butter and heat it over medium low heat until it thickens up a bit. Add a little salt and pepper if desired. Remember that the Parmesan cheese is salty, so don’t add too much. 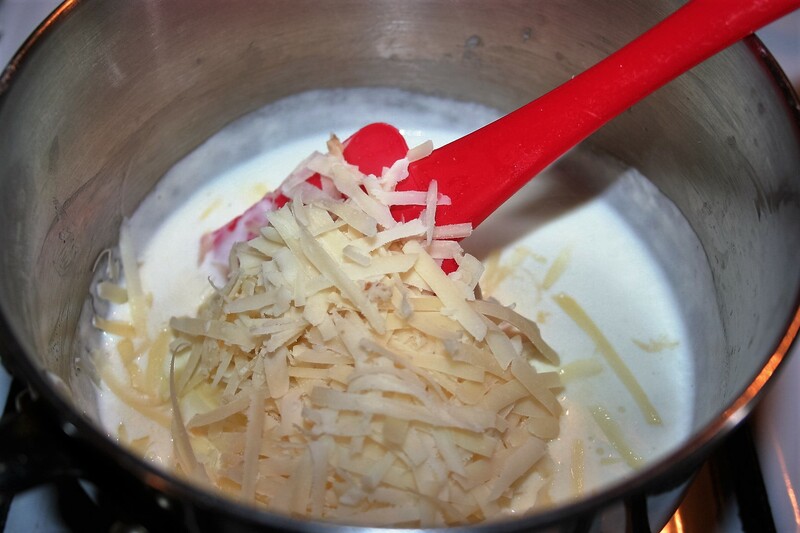 After it thickens up a little, add 1 cup shredded Parmesan cheese and stir. Unfortunately, I forgot to take a picture of the sauce before I added it to the pizza crust, so this is the best I can do. We put it on the pizza crust, added cooked chicken, turkey bacon and spinach. I’ll share that recipe another time (probably next week). 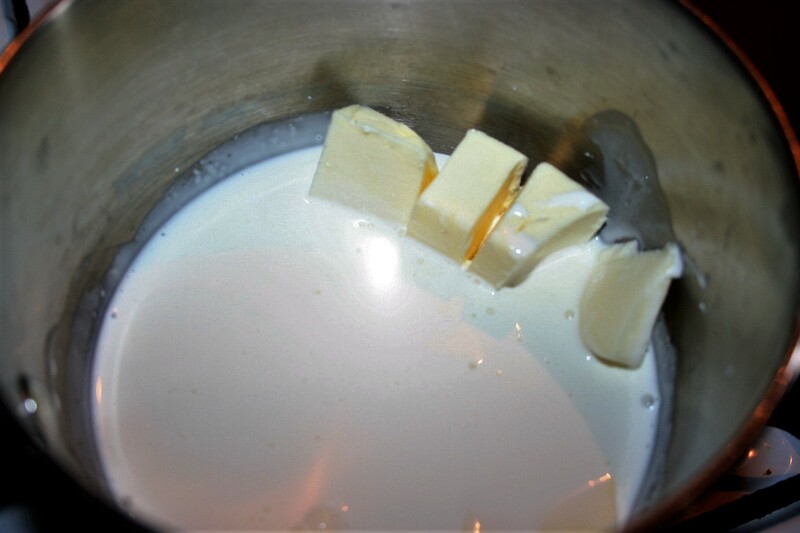 Combine butter and cream in a saucepan over medium-low heat. 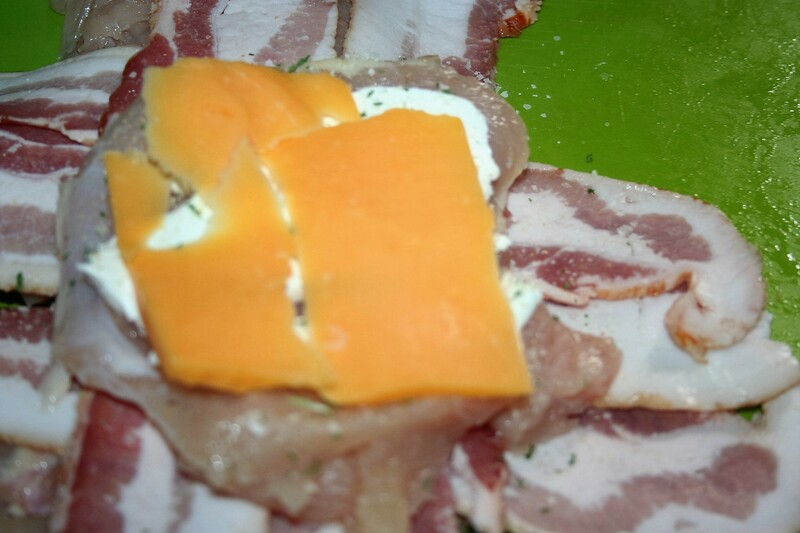 When it thickens a little, add the Parmesan cheese and remove from the heat. Stir until it is all melted. I am a homebody. I seldom leave the house. There are however, instances when I do make plans to have lunch with a friend, go shopping with my sister, have a girl day with my daughter, or some other such thing. At first when Michael would ask me about my activities, such as these, I mistook his intentions. 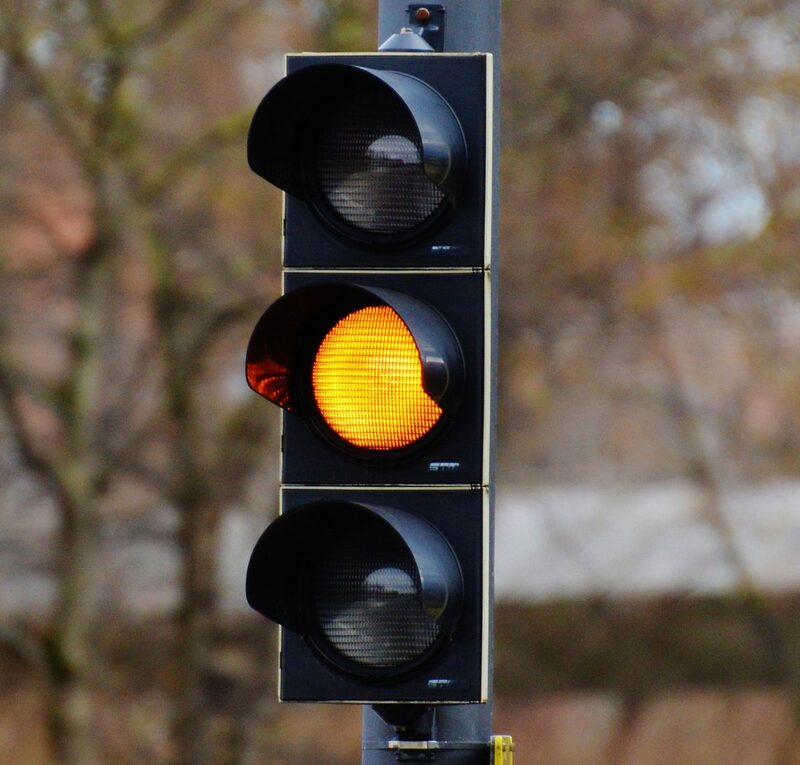 I felt controlled or like I had to ask permission to do anything. After conversing about this together, I learned of his deep love, concern, care, and protectiveness regarding me. You see, he wasn’t being controlling. He loves me so much and feels responsible for me. So much so, that he is on alert when I am going to be away from home, in case I should need him. I cannot tell you how many heated conversations we had about this topic before I understood his desire to know my whereabouts and activities. It wasn’t until I calmly broached the subject that I was able to hear his heart. I stopped being defensive, feeling like I had to report to him as if he were my parent and I were an underage child, and realized it is his love and care for me instead. It can also seem as if he didn’t trust me. But again, that is just an assumption. Calmly communicating about the subject revealed his true heart. The truth of the matter is that being married, he has every right to know where I am at all times and vice versa. It is not a control issue, it is a courtesy and an expression of love and care. So once again, it is important to think the best of others and not make assumptions about their motives for doing things.